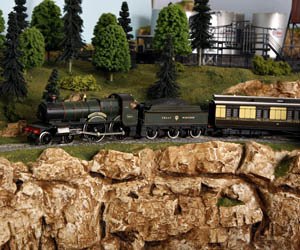 gccdrailway.org is the onlineÂ home of the GC & CD Model Railway Group. Based in Melbourne, Australia, the GC & CD have been been operating a timetable-driven model railway since 1982. The rock face at the end of Malesden Valley is a major scenic feature of the GC & CD Railway. Cherylvale Station sits atop the Cherylvale mainline, linking the township of Cherylvale with the passenger platforms down in the valley. The GC & CD Railway operates freight using a computerised waybill generating system called FTRACK. The Esso Oil Depot at Dannyville provides half of the fuel oil requirements for the GC & CD Railway industries. The Rodhurst narrow gauge railway, carries coal from the Rodhurst Coal mine to the Hutchinson & Son Colliery. In order to allow for future flexibility and ease of movement, the GC & CD layout follows a modular design comprising 6 modules. On a layout designed to run timetable operations, good clean, functional panel design is imperative. At the heart of the GC & CD block and signalling system are a pair of industrial Programmable Logic Controllers (PLCs). Puffing Billy is a narrow-gauge tourist railway in the Dandenong Ranges, east of Melbourne. The Taieri Gorge railway operates out of Dunedin, NZ. Passenger and parcel traffic on the GC & CD are run to a timetable over a scale 24 hour period. Communication between stations on the GC & CD is conducted using bells.